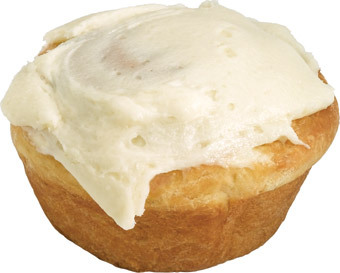 A tasty cinnamon roll swirled with moist cinnamon filling and topped with a cream cheese smear icing that melts in your mouth. WOW, it’s big. Bulk cinnamon rolls are available in three delicious flavors: Cream Cheese Smear, Caramel Iced, and BIG Cinnamon Roll with white icing. They’re sold in convenient Foodservice 4-packs. Excellent bake shop quality. Small 4-packs so you take out only what you need, when you need it. Mix and match what sells for you. Only (6) 4-packs per master case—so you have just the right amount for Mondays, Tuesdays, Wednesdays, etc. Requires less freezer space. Reduces waste on the front end—and on the back end. Great complement for your gourmet-coffee program. Acrylic bakery case merchandisers available.